Chao Coasting To Confirmation As Trump's Transportation Secretary : The Two-Way Elaine Chao, wife of Senate Majority Leader Mitch McConnell, was President George W. Bush's labor secretary and served in top transportation jobs in the first Bush and Reagan administrations. Secretary of Transportation-designate Elaine Chao testifies at her confirmation hearing before the Senate Commerce, Science and Transportation Committee. Listening are her father, James Chao, left, and husband, Senate Majority Leader Mitch McConnell. The incoming Trump administration will look to tap private investment funds to help rebuild and expand the nation's highways, railways, seaports and airports. 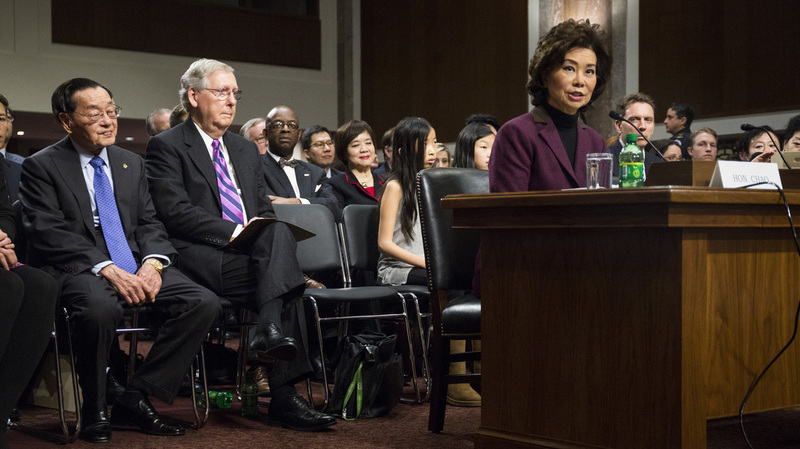 That's what Elaine Chao, President-elect Donald Trump's choice to be transportation secretary, told a panel of senators in a rather friendly confirmation hearing Wednesday. Chao, who served as labor secretary under President George W. Bush, and in top transportation posts during the first Bush and Reagan administrations, says the nation's economic growth "is jeopardized by infrastructure in need of repair, the specter of rising highway fatalities, growing congestion and by a failure to keep pace with emerging technologies." She also acknowledged that the federal Highway Trust Fund, which is funded by gasoline taxes, is running out of money and may soon become insolvent. So Chao told senators on the Commerce, Science and Transportation Committee the country needs "to unleash the potential for private investment in our nation's infrastructure," and look to innovative financing tools such as public-private partnerships. "In order to take full advantage of the estimated trillions in capital that equity firms, pension funds and endowments can invest, these partnerships must be incentivized with a bold, new vision," Chao says. "This president has a bold vision," which Chao says will be announced soon after Trump takes office Jan. 20. During the campaign, Trump often criticized the state of the nation's transportation and urban infrastructure, and he promised to spend a trillion dollars repairing and expanding roads, bridges, railways, airports and other infrastructure. But experts question how much private financing many infrastructure projects can attract. Investors will only fund those projects that can generate a good return on that investment, such as roads and bridges that charge tolls. And Chao acknowledged as much during the hearing, saying "for [public-private partnerships] to be truly effective, there needs to be revenue streams that need to be assured." But she added that when it comes to funding the nation's critical infrastructure repairs and upgrades, "we all know that the government doesn't have the resources to do it all." Chao, 63, is among Trump's least-controversial Cabinet-level appointments. Senators of both parties praised the longtime Washington insider's experience and expertise, and noted her friendship with them and their spouses. She was introduced at the hearing by her husband, Senate Majority Leader Mitch McConnell, who borrowed a quote from former Senate Majority Leader Bob Dole when Dole introduced his wife Elizabeth at a confirmation hearing for the same job. Dole paraphrased Revolutionary War hero Nathan Hale by quipping, "I regret I have but one wife to give for my country's infrastructure." Chao thanked senators for their support, joking, "I will be working to lock in the majority leader's support tonight over dinner." Though Chao has been criticized for her environmental record and by organized labor groups who say she too often sided with industry in enforcing labor and safety regulations, she is expected to easily win confirmation by the Senate. A wide range of transportation industry groups has praised her nomination.